These are Solaris Hudguns Complete creation tools, there are not playable content, just TIFF, PSD,3DS MAX files (and something more). 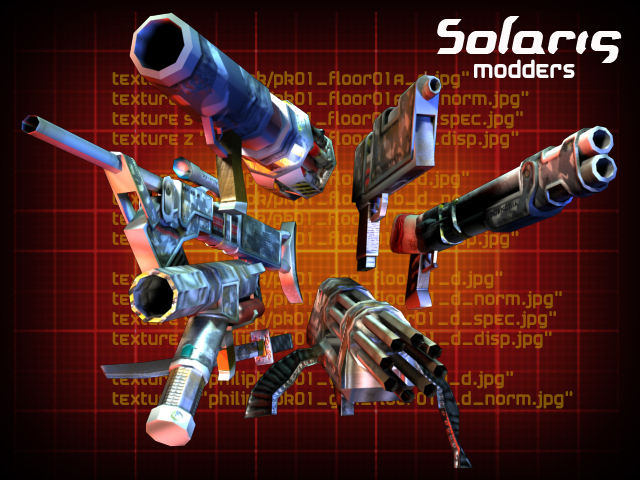 You can complete this package with Solaris Complete Mod to understand how it works. There are some older content that you can use in game, like GUI. What kind of plugin did you actually used to export it from 3DStudiomax (I guess you used that program?) to .md5? The zip-file is full of files like DS_Store and Thumbs.db please avoid them. I stop used 3D max some years ago and move to maya. MD* files are original files from ID Software, there where very popular in original hudguns release years, but, like i explain on Pyccna Post, i have problems to convert files from 3D Studio to MD5. MD3 files are much more simply, it don´t need Bones to work, and the first sauer engine use MD3. I only have a Alpha Blaster hudgun that i was made for MD5 but i can not export good whit 3d studio plugins and i was testing with blender. If somebody want to update to this file type, the best would be use Blender instead max. (you can export mesh to *.obj and import on Blender). Also Sauer suport *.obj 3D files, i recomend use this file type to static models. Thanks for the information about the formats; but I'm already quite aware of that =P. My question was pointing more towards what version of 3D Studiomax did you use as the new versions uses the .3ds format (and I'm not familiar with 3D Studio Max). A lot of other games which have an Open Source-based community have the same trouble in not being able to convert their models to a format which supports bones (.iqm is still quite buggy as I've heard). A cleaner version of the modding kit can be found here. ok sorry! i probably use 3D Studio MAX 9, after Max9 i try max2012 but just like a test, i was moving to maya in 2012. You can open *.max files whit a newest version, and export to OBJ. Max files have animation in object mode (not bones), so, you can not use original animation to create md5 files. Also yo can import md3 files with animation, max files are not very important in this case. The most of the work are in TIFF or PSD, there you can found how geometry is UV, and made modifications on it. If you want change or add geometry, the best can be import on your reference 3d software. In some models, in quad like example, i use Zbrush (not very well at that time). i hope you help the answer. In some TXT license files, you can found my email. Please, write me for anything, i will help if i can.